Currently more than 250,000 pilgrims travel the Camino de Santiago each year spread over different Jacobean routes throughout the peninsula, such as the French Way or the Northern Way. 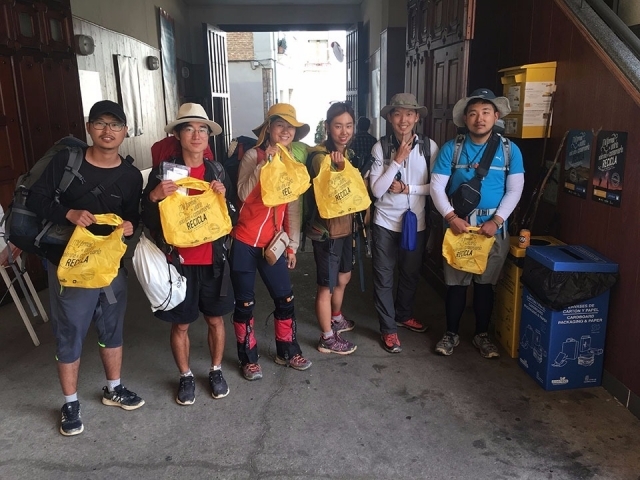 Each of these pilgrims generates in his trip to Santiago de Compostela a large amount of waste such as paper, cardboard, briks or plastic containers, so his awareness of recycling is essential to prevent the spectacular natural environments of the Camino to be seen seriously affected by our impact. Working in this sense, the non-profit environmental organization Ecoembes launched last summer the Camino del Reciclaje initiative, which was born in 2015 in the area of ​​Castilla y León, expanding in 2016 to Galicia and in 2017 also to Asturias. The objective of this campaign, launched on the Camino Francés and the Camino del Norte as it passed through Castilla y León, Asturias and Galicia, was to provide pilgrims with the necessary information and tools (such as the 62,000 pilgrim kits distributed) to get them to leave the Camino de Santiago as they found it, without any trace of waste. The result, once the initiative is concluded, is more than 142,500 kg of recycled containers between pilgrims and hospitaleros; of the total recycled waste, 38,782 kg have been introduced in the yellow container (plastic containers, cans or briks) and 103,776 kg in the blue container (paper or cardboard containers). The role of the almost 300 adjoining Camino de Santiago accommodation has been fundamental in the campaign, according to Ecoembes, because it is one of the most common places where pilgrims deposit their waste. In the lodgings distributed in A Coruña and Lugo, 146, the pilgrims have recycled 74,150 kg of containers; in those of Castilla y León (107), 55,750 kg and in the Asturians (44), 12,600 kg.